Are you wondering how the Austin real estate market will be in 2017? Will prices continue to go up? Will interest rates go up? Will people stop moving to Austin? If you’ve either asked yourself or someone else this question, you are not alone. This week was a busy week for economic forecasters all around the city. 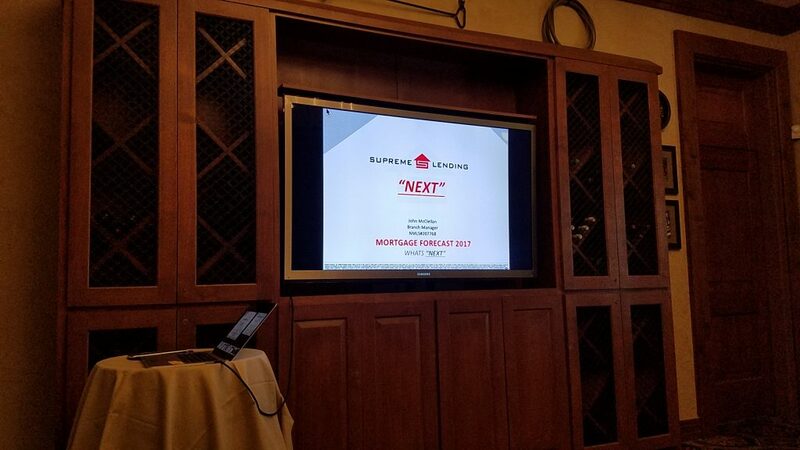 Recently, members of our office attended the 2017 Home Builder’s Association, an annual forecast meeting held by Mark Sprague with Independence Title, and also a forecasting meeting with John McLellan with Supreme Lending. The HBA meeting was a math lover’s dream. It was loaded with statistics and information from a host of speakers. The purpose of this meeting is to educate home builders on what is to come, and to give them an idea of how many homes they should be building, what price ranges, and much more. In 2016, there were 29,500 homes that sold through the MLS in Central Texas representing over $10 Billion in sales. As you would expect, both of these numbers were record-breaking events. There is currently a major shortage in commercial office space in Austin. For example, there is 1.2 Million sqft of office space at The Domain, and it is 99% occupied. While there are other large-scale commercial spaces coming to the market, it’s possible that this could lead to a situation in the future where employers looking to relocate their businesses to Austin may not be able to do so. The unemployment rate in Austin is approximately 3.6%. While this sounds amazing, it comes with one major drawback that can impact our economy and real estate markets. Ultra-low unemployment can hinder future job growth to the Austin area. The reason: employers that are considering a move to the region will have difficulty staffing positions from the available workforce (only 3.6% are looking for employment), since most people that are seeking work are currently employed at other companies. This means that they will have to poach workers from other companies…which means they will have to pay them more money in order for them to migrate. This is a factor that could affect employer’s desire to move to Austin and to expand their operations, which could slow job growth in Austin going-forward. According to Eldon Rude, Principal at 360 Real Estate Analytics, the strongest and most dynamic price points of the Austin real estate market is the $175k-$300k range. With rents continuing to rise (average rental price per sqft is approx $1.4), there will be growing interest in purchasing homes versus renting. Rude continues to say that in the last 1-2 years, the SH130 corridor has been a big point of conversation with a lot of opportunities being purchased and entitled now. We are building towards that area, and the planned HEB at 130 and 973 could be a huge deal. There are development concerns for this area due to the fact that many of the areas nearby are in the Austin ETJ, which come with city-imposed regulations on future development. All three of these forecasts expressed serious concerns about Austin’s elected officials and their decision making regarding job growth and future development regulations. Their unified opinions are that the city isn’t offering nearly enough incentives to continue to attract big businesses to Austin. If this decision making philosophy doesn’t change, it will have severe implications on our regional growth in the next 18-24 months. One of the other common questions that I often hear is: “Is Austin an Overvalued Real Estate Market?” The answer to this came from Mark Sprague’s forecast (the PDF of PowerPoint slides is downloadable at the bottom of this blog post). He says that currently, Austin household median income is $63,603 and the Austin median home price is $263,900. He said the ratio between these two values has Austin more affordable than cities like Miami, Portland, Denver, Washington DC, Seattle, Boston, NYC, LA, San Diego and San Francisco. Dallas will likely file bankruptcy due to underfunded pensions, and several other cities in Texas might be close behind. According to these analysts, we should anticipate a 5-10% increase in production in 2017. Most of this growth in the market will be at $300k price range and below. Long story short, everyone is expecting 2017 to be another great year for home buyers and home sellers in Austin, Texas. Let’s have a great 2017!